Part of New Jersey will be spared from the biggest deluge of rain, and part of the weekend may be salvaged after all. Scenario #3 (Total Washout) is off the table! No models show the storm system getting "stuck" on top of us. Rain will exit NJ sometime Saturday. 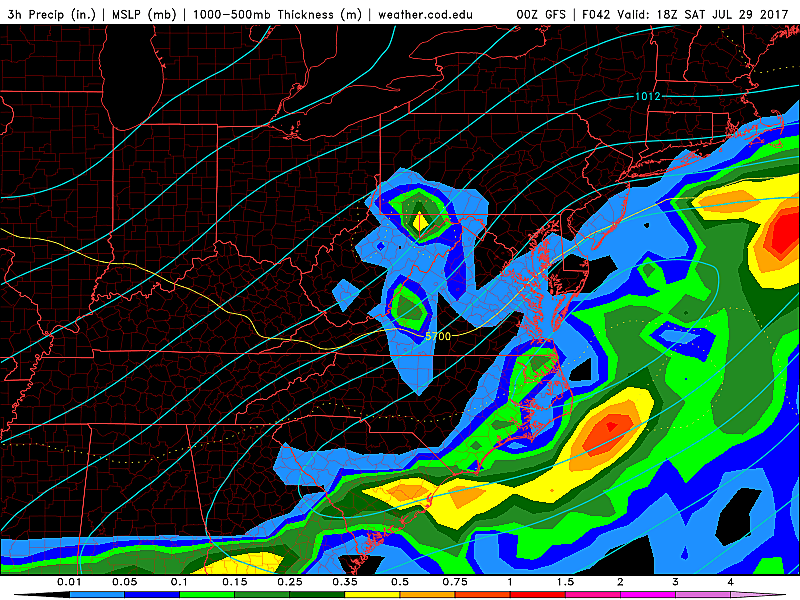 Scenario #2 (Period of Heavy Rain) looks like the answer for central and especially southern NJ. 2 to 4 inches of rain here, with locally higher amounts, will make flash flooding likely. The heaviest rain will fall between sunset Friday and sunrise Saturday. Scenario #1 (Flop) will actually play out for the area north of the Flash Flood Watch, especially north of I-78 in NJ. Yes, it's still going to rain. But only a half-inch to an inch, avoiding major flooding concerns. Most of Friday looks fairly quiet and mostly dry. Patchy dense fog will burn off through 10 a.m. Morning scattered clouds will progress to overcast skies through Friday afternoon. It should be warm and fairly humid, with high temperatures in the lower to mid 80s. Following model trends, the National Weather Service scaled back their Flash Flood Watch. It now only includes the southern half of the state — along and below Interstate 195. I'm not sure I totally agree with the reduction, as Mercer, Monmouth, and Middlesex counties may still see some very heavy rain — totals are just expected to end up below the "technical" flash flood guidance numbers. Such a watch means heavy rain may lead to potentially dangerous flash flooding of roadways and low-lying areas. 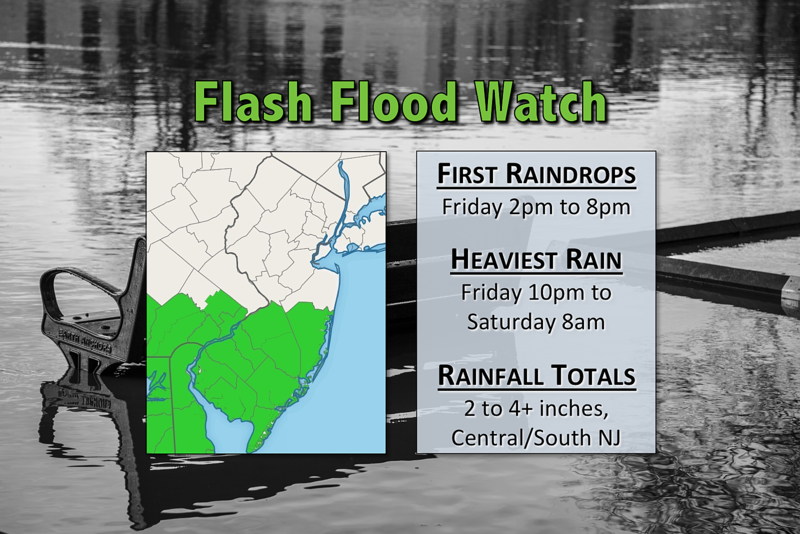 New Jersey's Flash Flood Watch is scheduled to be in effect from 2 p.m. Friday through 2 p.m. Saturday for the following counties: Atlantic, Burlington, Camden, Cape May, Cumberland, Gloucester, Ocean, and Salem. Initial showers may push into southwestern New Jersey Friday afternoon. Showers and thunderstorms will continue spreading across the state Friday evening. I would estimate first raindrops in any given location will fall between 2 p.m. (SW) and 8 p.m. (North). Very heavy rain will overtake southern and central New Jersey between about 10 p.m. Friday night and 8 a.m. Saturday morning. Rainfall totals in this area will probably end up in the 2 to 4 inch range — that's a lot of rain, in a very short period of time! It is possible that, as thunderstorms continually form and re-form over isolated areas, some rain gauges may ultimately collect more than 4 inches. This process is called "training," and can lead to some pretty dramatic flooding. As the heaviest rain aims for the southern half to two-thirds of the Garden State, it looks like North Jersey will be spared from the flooding threat. It's still going to rain. But totals will likely end up well below an inch, especially north of Interstate 78. We previously had concerns that the storm system would "get stuck" along the coast, keeping wet weather on top of New Jersey through late Saturday, Sunday, and even Monday. Confidence is rising this will not happen: The steady rain will come to an end Saturday morning. However, I think Saturday afternoon and evening can still be characterized as "yucky". Lingering showers and clouds will keep temperatures cool, with highs only in the lower 70s. We'll contend with a brisk wind all day too, sustained at 15 to 25 mph with gusts to 40 mph. OK, I don't want to get too excited here. But I really like what I see among the models for the second half of the weekend. As the storm system pulls away from the coast, skies will clear through Sunday morning. In addition, a significant drop in dew points will make for much drier and more comfortable conditions. While I can't 100% rule out showers on Sunday, I optimistically think skies will become sunny! It will be breezy, with high temperatures still a bit below normal. But if we reach the upper 70s along the coast and lower 80s inland, I don't think anyone will be complaining. This storm system is reminiscent of a wintertime nor'easter, which traditionally can cause significant coastal flooding and beach erosion. That threat looks to be mitigated this time around, both due to the storm's track and thanks to a relatively low astronomical tide right now. Having said that, minor coastal flooding will be possible at the times of high tide this weekend. (The flash and river flooding threat will be far greater.) In addition, the risk for dangerous rip currents will become elevated (moderate to high). Not that you're going to the beach on Saturday anyway.